"Just wanted to let you know that your shrimp is the best there is. I have been buying it for years and its the only one I will buy because the other canned shrimp does not cut it. Thanks for consistent high quality shrimp. I don't write anyone often but felt the need to. 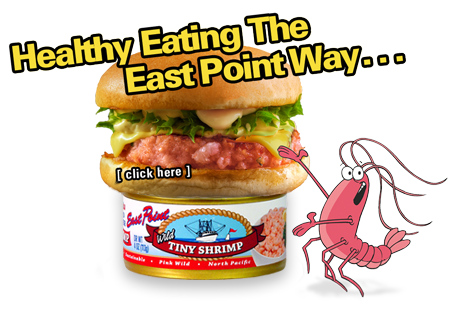 Thanks, Larry"
East Point Seafood's shrimp is a fully-cooked and ready to eat product that includes delicious shrimp meat, pure water, a little salt, and some citric acid. There are no preservatives, artificial coloring, or added flavors—just the color, flavor, and texture naturally found in this exceptional seafood product. As part of East Point’s commitment to the environment and total resource utilization, all shrimp shell is recovered and processed for use in organic agriculture, aquaculture, dietary supplements, and water treatment. Our shrimp are caught by local West Coast fishermen in the deep, cold ocean waters off the coasts of Washington and Oregon, then immediately packed with ice and kept at 32-34 degrees. Boats returning to port off-load the shrimp either onto our own dock adjacent to the cannery, or at buying stations in ports from the Canadian border down to Northern California. Our commitment to use only wild, locally harvested, fresh, cold water shrimp guarantees that the East Point canning process always begins with a high quality product that beats the warm water imported shrimp hands-down! The shrimp canning process begins with a de-icing bath, then an innovative peeling mechanism that removes the exterior shell and heads, followed by washing, separation of any remaining shell, and blanching before moving to the inspection line. The inspection process is centered around a conveyor line and a team of workers along both sides whose job it is to spot and remove any and all particles of material other than pure, clean shrimp meat. The shrimp are next conveyed through the canning stage where the meat is packed into cans and carefully weighed to ensure that each is properly filled. The cans are then closed, sealed, and immersed in 242-degree live steam and cooked for 20 minutes.